This Easy Thai Coconut Curry Chicken recipe is a simple one-pot meal. You can use any Thai seasoning or curry you like. There are jars of various types of Thai curry paste in the market, or you can use a powdered mixture. Serve this classic South Asian dish over cauliflower rice. Heat the coconut oil in a large skillet. The actual amount of oil depends on the size of the pan. You want a thin coating on the bottom. Add 1/2 medium chopped onion and 1 medium chopped red bell pepper. Stir and cook until onion is translucent and getting soft. Add the Thai spices (including the salt or seasoning salt). The amount will depend on the brand of spice mix you use. I use about 4 teaspoons but for a different brand like a hot paste, use closer to 2 teaspoons. Stir until you start to smell the spices. Add the 1 pound chopped chicken pieces. Stir until almost cooked through. Add the 3/4 can unsweetened coconut milk. Add the 12 ounces fresh or frozen green beans. Bring it to a boil, and then simmer until green beans are al dente. Serve with juice of one lime. Green curry is typically the spiciest Thai curry available. Made with young green chilis it isn't for the new-to-Thai-curry crowd who isn't ready for serious heat. Next up is red Thai curry, which uses red chilis, but isn't as spicy as green curry. 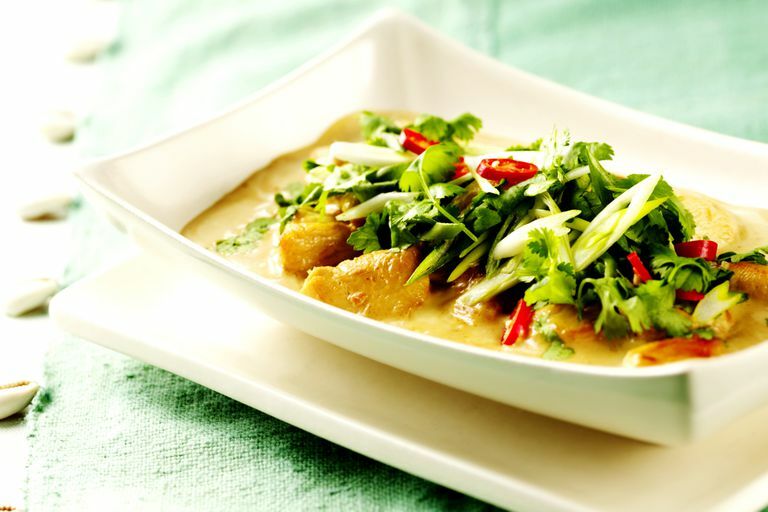 Yellow curry adds coconut cream, in addition to the coconut milk in other curries which yields a sweeter, richer taste than red and green curries. Massaman curry is milder than yellow curry and has a similar taste to red curry, but the addition of peanuts offers a sweeter flavor. Panang is the mildest of curries, owing to its use of sweeter spices such as cloves, cinnamon, cardamom, and nutmeg, including the addition of peanuts.